Develop and “package” an identity for Lulu Bedding that emphasized its quality and exclusivity. Brand the identity visually and in copy to complement the preciousness of the product. Define a Unique Selling Proposition (USP) to set the distinctive Lulu Bedding designs apart from more familiar, mass-produced, run-of-the-mill bedding. Enhance the desirability of the product to justify its high-end cost. Include a valuable offer to encourage response. Erin already had access to a strong potential audience through her children’s clothing website, www.babylulu.com. CDMG determined that by 1) developing a bedding website linked to her clothing site, then 2) utilizing the most advanced search engine optimization (SEO) and search engine marketing (SEM), Erin would be able to reach both current customers already intrigued with her original fabric and clothing designs and potential customers seeking similar products. 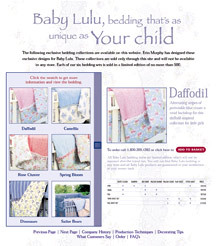 Drawing from their tested and proven proprietary V.I.V.A.™ (Valuable Information, Value Added) direct marketing system, CDMG went to work to design a bedding website that was able to stand on its own, yet complement the Baby Lulu clothing site. The typestyle, the soft lavender color and the reader-friendly page layout all worked together to emulate and showcase the products. Photos of Erin with her daughter were used to help establish her personality and credibility. CDMG created a compelling, “insider-like” message/theme, which spoke to discriminating shoppers willing to pay higher prices for high quality, unique products. They developed a persuasive copy tone and a friendly, reassuring design to draw readers into the message and the products. Rather than downplay the expensive price, CDMG recommended utilizing it as a strength with the line, “We’d rather explain the price than make excuses for the quality.” That USP underscored the product positioning with an attitude that respected the audience and their preference for top quality and exclusivity over discount pricing. The website content was designed to both inform and educate potential customers as to the exceedingly high standards Erin Murphy set for her products’ design, materials and production. The warm and inviting message, written in her voice, created a word picture that was at once persuasive and reassuring. This copy added value and enriched the website content, further establishing Erin’s credibility as well as her discriminating taste. 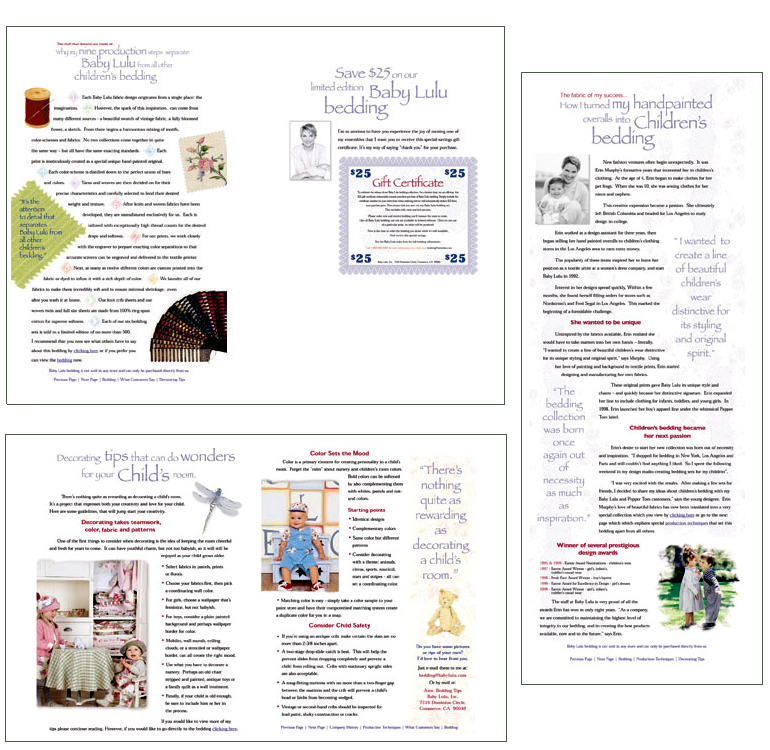 The content-rich site included in-depth product information, helpful decorating tips, an educational explanation of the unique production process, and testimonials from satisfied mothers. The clothing bonus also served to cross-promote Erin’s new line of baby sleepwear to customers. Knowing it would be a huge challenge, CDMG eagerly embraced the opportunity to establish an identity for, and market, this unknown, high-priced brand. Positioning Lulu products as the “Rolls Royce” of bedding, CDMG’s targeted marketing and adherence to direct marketing principles then worked to persuade thousands of quality-seeking bedding buyers to visit and use the website. In spite of prices ranging from 600%–800% more than bedding found in department stores, Erin was able to turn her website visitors into customers and cross-promote her other exclusive products at the same time. And, while she planned to market her bedding products solely online, the website served as an impressive showcase for potential retailers in case her marketing plans changed in the future.